Creating bright minds - the key to our future. IODE Nova Scotia gives support through scholarship, bursaries, grants, awards and prizes for university, college and high school students. 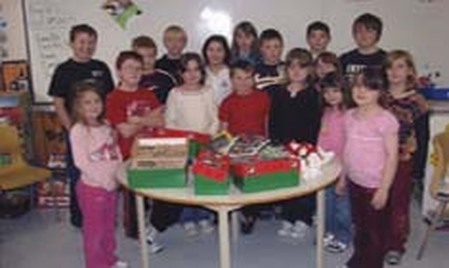 Supplies amenities to needy classes, locally and in remote northern communities. Supports special educational and cultural programs. Supplies books to school libraries, day care and pre-school programs. Participates in Baby Think It Over program. In 1986 following the death of Miss. Annie G. Murray of Springhill, the last surviving charter member of the Nova Scotia Provincial Chapter, it was voted that a scholarship fund be set up in her name to be presented annually to a second year student at the Nova Scotia Teachers College. Please click here for more information about the Annie G. Murray Memorial Scholarship. Through the generosity of the Primary Chapters of Nova Scotia 4 bursaries were given throughout Nova Scotia. Download and fill in - Application cannot be submitted online. ​A number of Primary Chapters are involved with “RealCare® Baby Program” program offered to Junior High and High School students. 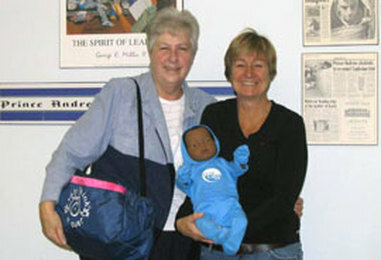 This infant simulator is a life-like doll with realistic computerized responses, which allows teens to appreciate the responsibilities involved with parenthood. Many teens come to realize, after spending a couple of days and nights with the baby simulator, they are not yet ready to take on the pressures and responsibilities of parenting. A local High School teacher, Ms. D. MacDonald told us that this has become a very popular course and the number of students enrolled in the course has increased significantly this year. As members of IODE, we are advocates of youth and are well aware of the problems associated with teen pregnancy and child abuse, and the importance of learning good infant care skills.